Gadi Amit, president and principal of NewDealDesign, aims to create tech that fulfills human emotional needs. Scrip is a concept for a peer-to-peer payment device created by NewDealDesign, the studio behind the Fitbit. When tech is one-size-fits-all, easy to use and overly digital, it can cause us to lose touch with our humanity. NewDealDesign, the studio that helped to develop the Fitbit, aims to simplify our devices. Gadi Amit, the company’s principal designer and president, encourages his team to think differently about product design. However, he and his designers know that counterintuitive ideas, while important to consider, are not always the best ideas. Rather, they’re often a springboard for further innovation. That’s part of the spirit behind Scrip, a concept device that NewDealDesign announced yesterday. It’s an idea for a new way to conduct peer-to-peer payments -- and make transactions tangible and tactile in an increasingly cashless society. Throughout his career, Amit and his team have led the design for the Lytro camera, the recently suspended Google modular smartphone moonshot Project Ara, hardware for Intel, connected home devices and more. Not to mention, NewDealDesign is responsible for giving wearables a name with the Fitbit. A decade ago, pedometers were cumbersome and uncool. Now they’re sleek and trendy. NewDealDesign prioritizes a patience for the process of iterating and reiterating, and Amit values people who are driven to devise surprising solutions. This, of course, is at the expense of speed and expansive growth, some of the primary virtues of tech entrepreneurs. In Amit’s view, a 40-person team in San Francisco can compete with a multi-office global design firm, in terms of the opportunities for interpersonal connections and collaboration. The intimate size of the team has helped the studio differentiate itself and stay true to its contrarian ideals. About six years ago, NewDealDesign introduced what Amit calls a “dark horse” theory to its creative process, which involves asking “What is the opposite?” among a sea of intuitive proposed solutions. This led the first Fitbit to be concealed in a woman’s bra rather than proudly displayed, and it carried over to later models, which still refrain from the macho flaunting of personal health stats. Project Ara rejected the monolith smartphone in favor of an adaptable, buildable one. 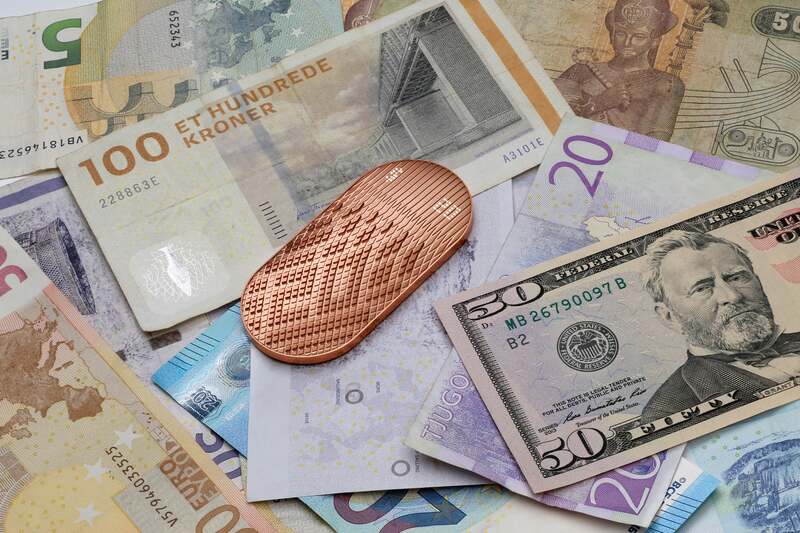 Scrip, this year’s project, is a copper-colored handheld object meant to store money. The idea is that, rather than paying with a credit or debit card or a service such as PayPal or Venmo, you would load some allotment of money from your bank account to your Scrip at an ATM, a bank or using your smartphone. You could then pay a friend across the table -- or make a purchase at an NFC terminal. But Scrip is more than just another way to beam your funds. Its tactile surface serves to make its hypothetical users more mindful of the money they’re exchanging. For example, if you were paying $31 for something, you could swipe the Scrip to simulate handing over a $20 bill, a $10 and a $1. 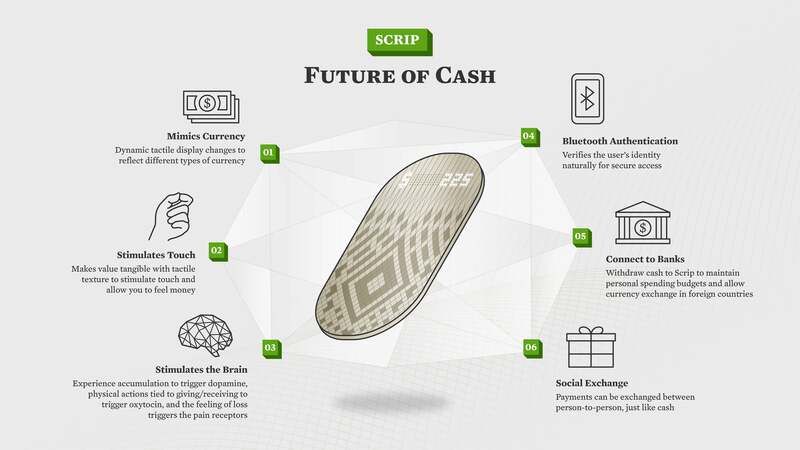 The device would become heavier for higher payments, a Braille-like pattern on its exterior would change to reflect each denomination of currency and the amount would be displayed on a tiny screen. Cash prevails because it’s anonymous, untraceable and universal, Amit explains, but that’s only part of the picture. When the NewDealDesign team decided to reinvent digital payments, they didn’t intend to add friction for the sake of adding friction. They did their research. Different payment methods inspire different neurological and behavioral reactions. The exchange of paper money, which is a social interaction, triggers the release of the hormone oxytocin, according to one study. Paying with cash inspires greater feelings of pain and loss than paying virtually, other research has found. And it’s no surprise, given that so many people accumulate credit card debt, that people tend to be less financially responsible when paying in the abstract. As of now, Scrip is not functional, but the team has built three models to showcase various possible physical states for the device. They provide the look and feel of money, from the shiny penny-colored exterior, to the round shape, to an engraved signature on the back that reflects the markings and sovereignty of banknotes. Amit and Yoo acknowledge that Scrip may never become a consumer product, but they hope to apply their findings about tactile interactions to future designs. From generating an abundance of ideas for each project to presenting a more deliberate way of exchanging money with Scrip, patience and thoughtfulness permeate NewDealDesign’s work.